The expression "B movie" historically referred to a low budget movie made as the 2nd feature of a double bill; some "filler" entertainment. However, the term has come to mean a movie of a lesser quality, something which may be worth a look but not necessarily something where you'd shell out your hard earned bucks to see at the theatre. Wait for the DVD; rent it at Blockbuster; hope that one of the specialty channels will show it at some point. Watch it if you've nothing better to do; watch it if you're sick in bed... and can't get up to change the channel. But don't shell out your hard earned bucks to see it at the cinema. "Yes, but did you like it?" I hear you ask. It was horrible. But I know from experience that if I like a genre, a certain type of film like an action or spy film, it is almost like I can't stay away; I just have to see it even if I suspect it's going to be a stinker. After all, how will I know exactly how bad it is unless I see it? How else to explain my presence in the theatre when Rotten Tomatoes ranks it with 39%? Okay, I went because I wanted a theatre hotdog. Sylvester Stallone is an industry, a movie icon and there is no denying him as a cultural influence over the years in the film industry. He's had his ups with the likes of Rocky and Rambo and he's had his downs with some forgettable films but he has certainly succeeded in imprinting his name on our collective consciousness. Consequently, this film under his tutelage was in itself a guarantee of public attention. However, Mr. Stallone just didn't stop with his own name on the marquee; he managed to attract a considerable list of big name action stars to develop an ensemble film. The term "ensemble cast" means that each actor gets roughly equal time so there is no single star per se. I must admit that I found the one scene where we have Bruce Willis, Arnold Schwarzenegger and Sylvester on the screen at the same time amusing. 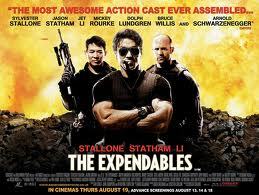 Sylvester and Arnold are playing fellow mercenaries while Bruce is the man doing the hiring. Bruce questions both of them about doing the job during which Sylvester and Arnold exchange sarcastic quips. Finally Arnold says, "Give him the job. He likes to play in the jungle." As Arnold walks off. Bruce asks, "What's the matter with him?" to which Sylvester replies, "Oh, he just wants to be president." Unfortunately, that's the high point of the entire film! Well, at least for me. Nevertheless, there are still enough blowing-stuff-up, fist-fightin', testosterone-filled moments to satisfy the most rabid fan of action films and those with a calculator will have their work cut out for themselves trying to tally the body count. According to Wikipedia, there are a few back stories of interest. Mr. Stallone asked Jean-Claude Van Damme but he refused so Stallone asked Van Damme's other Universal Solder star, Dolph Lundgren. Stallone asked Steven Segal to do a cameo but Segal refused. Sandra Bullock was rumoured to be involved - she and Stallone were in Demolition Man (1993) - but that didn't pan out. Whatever the case, Sylvester did manage to attract a lot of interest in this project. Despite a mixed critical response to the film, it has done decently at the box office. It had a budget of $80 million and seems to have now made a profit with gross revenue of $104 million. Sylvester has been reported to be mulling over a sequel depending on how well the film does and was quoted as saying, "If this does perform, I think it will open a little more liquidity in funding the sequel. I have an idea ready to go. People think doing a sequel is easy, but it's not because you need the element of surprise. I'm going to try to do something that's quite radical." Dolph Lundgren, the Swedish actor, got his break playing opposite Stallone in Stallone's movie Rocky IV (1985). The restaurant chain Planet Hollywood, competition to the Hard Rock Café, was started in 1991 with the backing of Arnold Schwarzenegger, Sylvester Stallone, Bruce Willis and Demi Moore. The chain has gone bankrupt a couple of times. Arnold backed out in 2000. Bruce Willis got his big break in the television series Moonlighting, from 1985 to 1989. Arnold Schwarzenegger's accent was deemed so thick in his first film Hercules in New York, 1970 that his lines were dubbed after production. Mickey Rourke for his role in the movie The Wrestler (2008) was nominated for an Oscar but lost out to Sean Penn. Rourke left acting from 1991 to 1995 to go back to his career as a boxer.